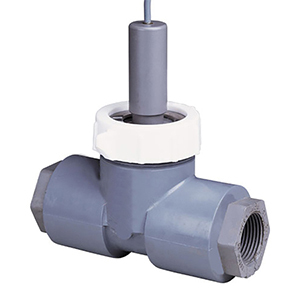 The OMEGA™ PHE/ORE-4580 bypass flow pH system has a modified 1" CPVC or PVDF tee and cable assembly matched to the flat surface pH and ORP electrodes. Each GPM flowing through the tee results in a 2 ft/sec velocity which performs the self-cleaning action. No moving parts, liquid jets or power are required. Flow rates of 3 to 5 GPM provide adequate cleaning velocities in water weight applications. Exact control of flow rate is not required. Electrodes can be used in applications in which emulsions, slurries, oily wastewater and other difficult flowing samples are present. Continuous selfcleaning affords uninterrupted readings. Automatic temperature compensation is available as an option. Cable lengths available up to 15 m (50'), consult Omega for per foot price. For 5% HF Applications, add suffix "-HF" to the electrode model number, add $50 to price. For low conductivity applications, add suffix "-LC" to electrode model number, add $30 to price. For Acrylamide Gel, add suffix "-ACRYL" to electrode model number, add $30 to price.